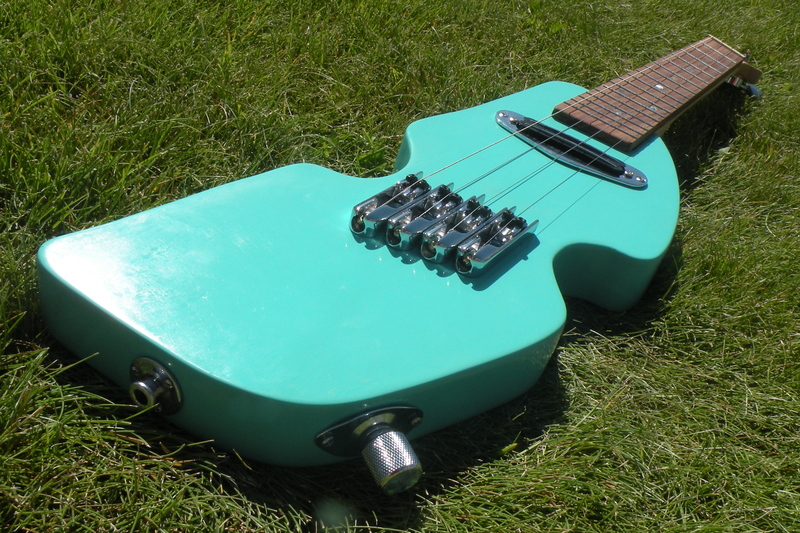 I’ve built a bunch of electric ukulele, but all of them have been modeled after full size electric guitars. 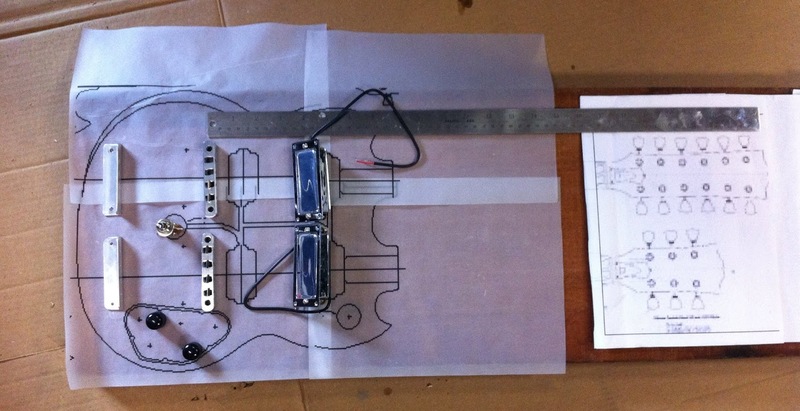 For this project I set out to design my own electric ukulele. I think it turned out great. 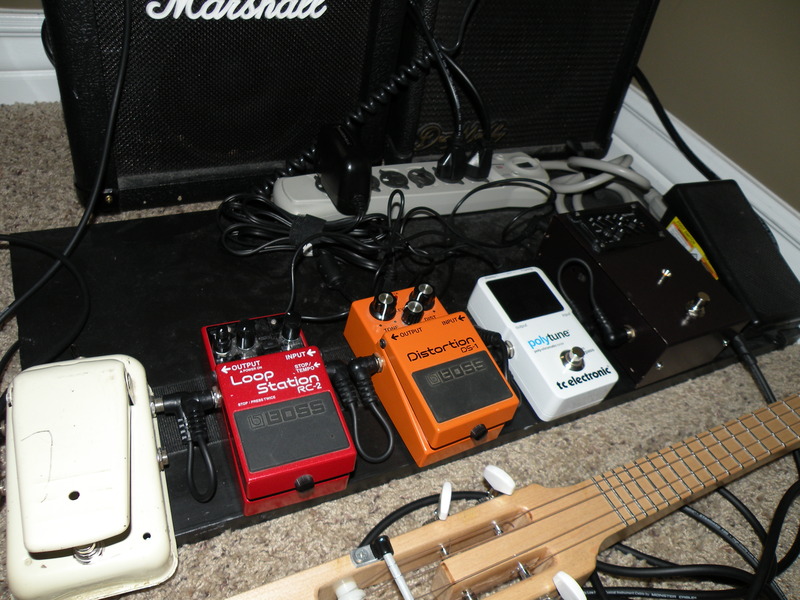 My other electric ukuleles have been modeled after guitars from Fender and Gibson. Can you name all of these models?? Here are some sketches that I drew as I designed this instrument. You can see how how the designed changed and progressed. I probably shouldn’t admit this, but part of the headstock design was influenced by the fact that I had quite a few left hand tuners in my possession. 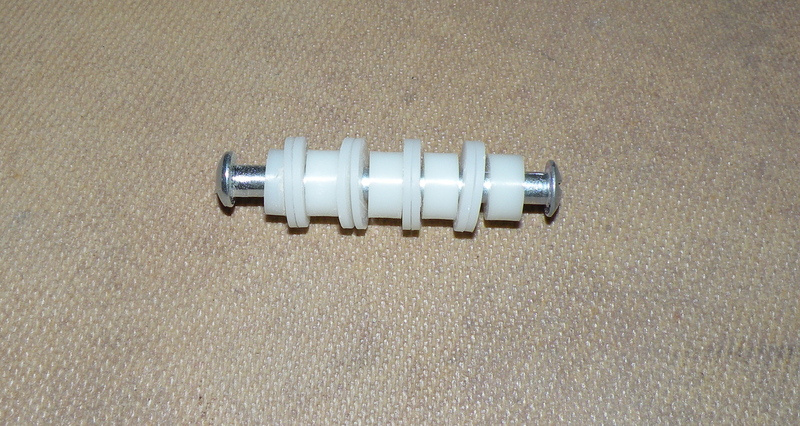 I purchased sets of 3-on-a-side tuners to use for my Fender style builds, but only needed the right hand ones. After all of the parts were fitted, I leveled the body with some putty. It is important to have the body as smooth as possible before the prime, and color coats. 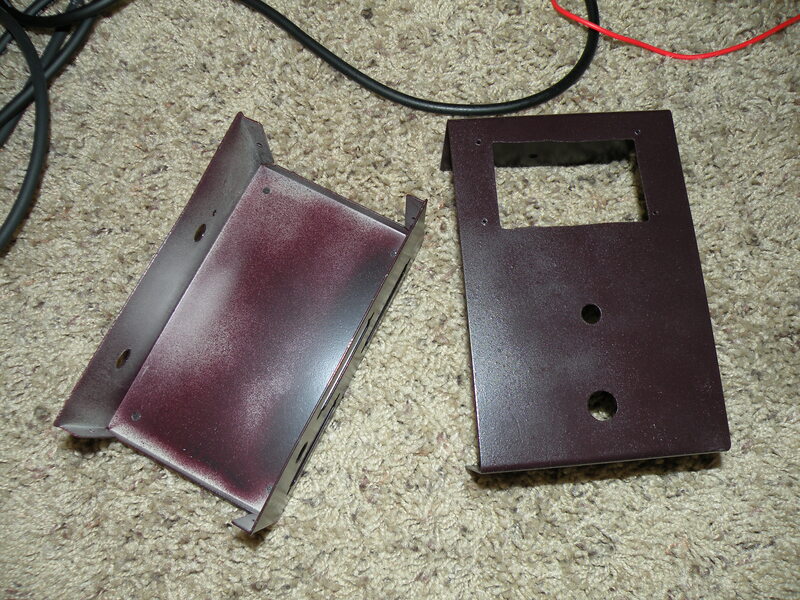 The body was primed, given a nitrocellulose color coat and then a nitrocellulose clear coat. 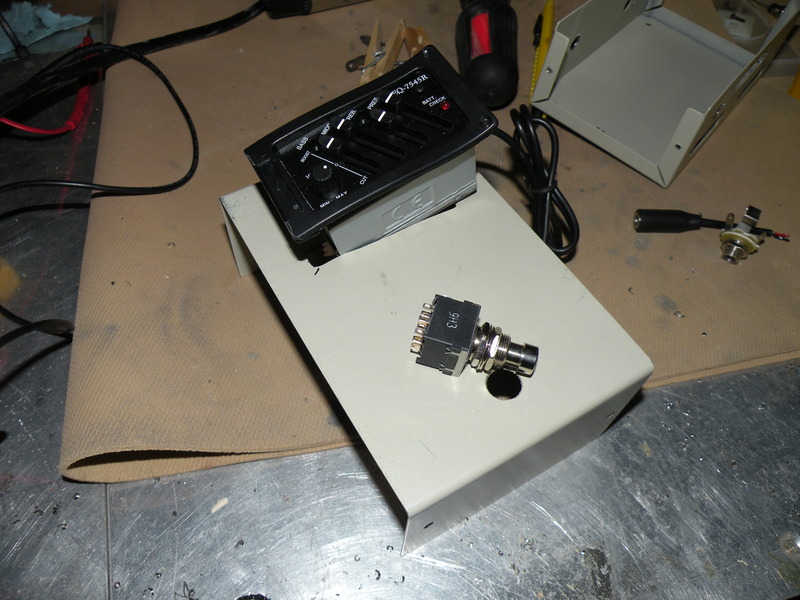 I wanted to try having the volume knob on the side of the body instead of the top. 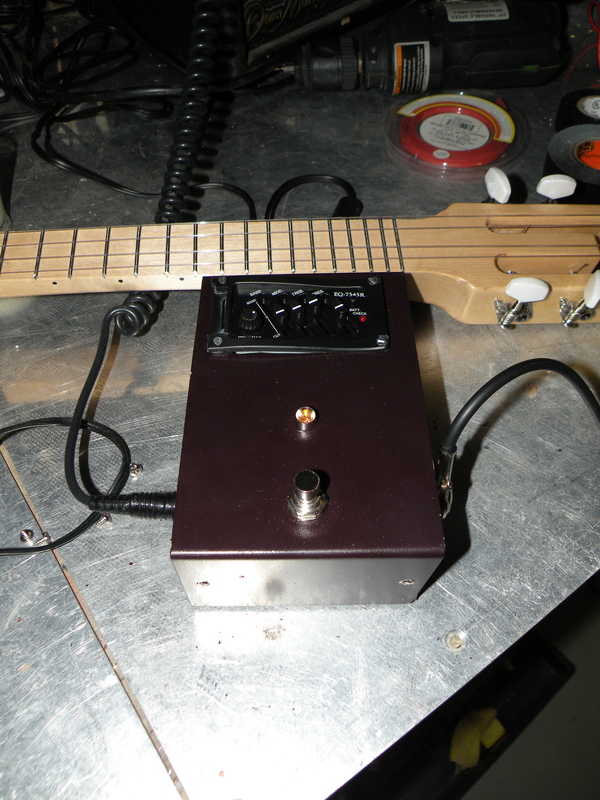 Doing this also allowed for a bigger cavity to house a push/pull switch to split the hot rail humbucker. 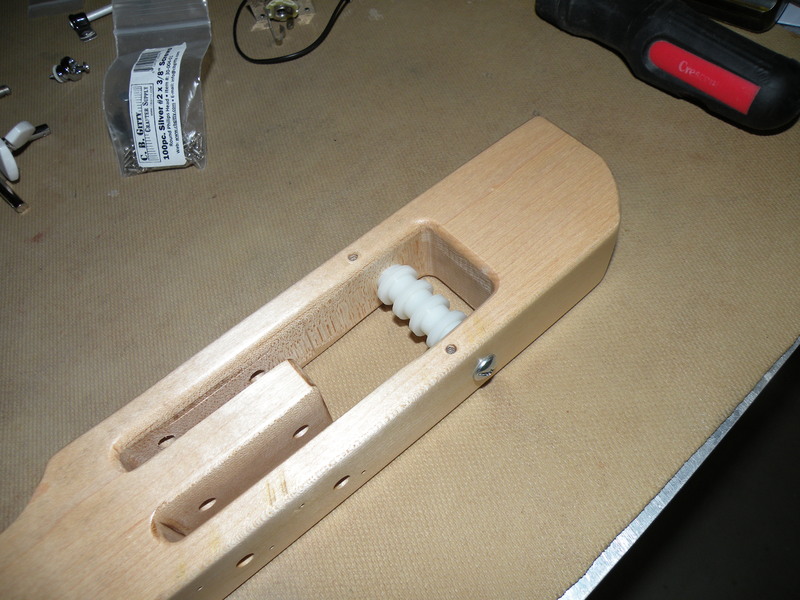 To keep the back and top as minimalist as possible, I drilled long holes from the pickup cavity to the combination strap peg/jack. 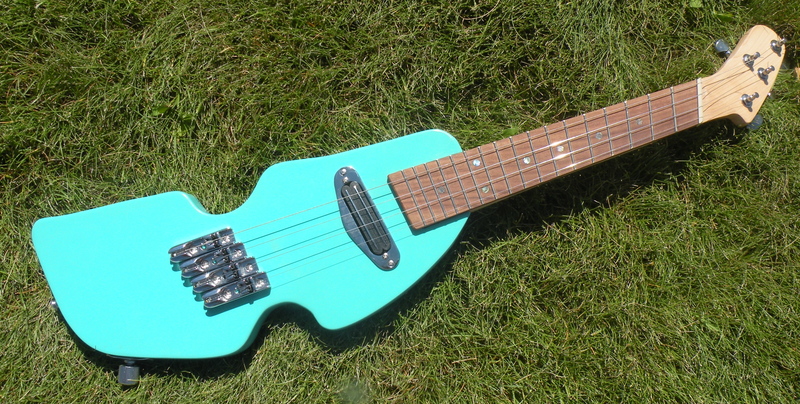 I’ve named this the “Wave Ukulele” because the body made me think about waves crashing against the shore. Once I gave this a name, I tied other design element to this theme. 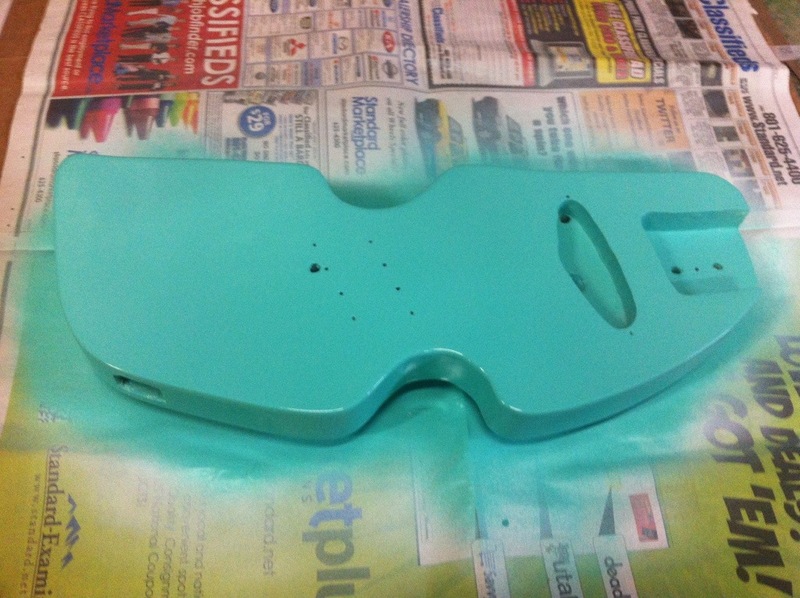 The body is Sea Foam Green, and the fret markers, side markers and even the cap on the volume knob are abalone. 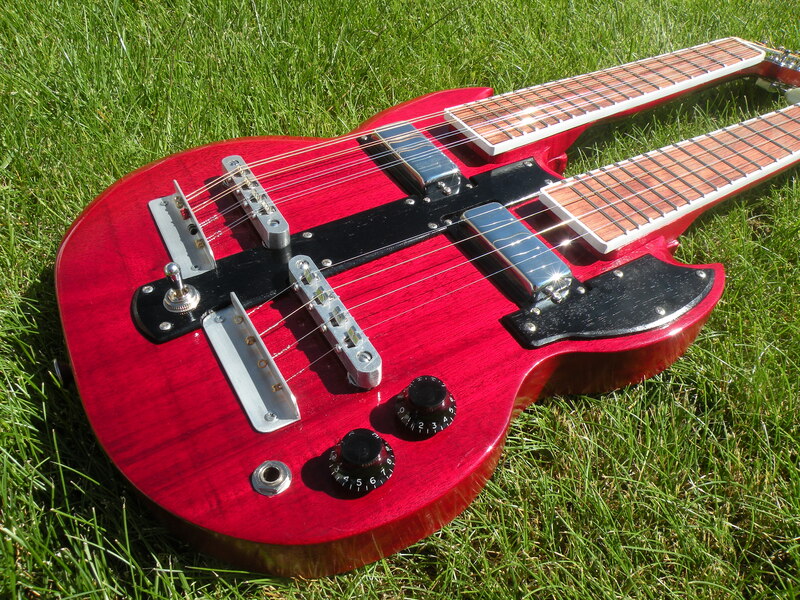 This build was my first foray into the world of fanned frets. The bottom string has a scale length of 17 inches and the top is 18 inches. It’s a little different to play, but it’s very easy to get used to. 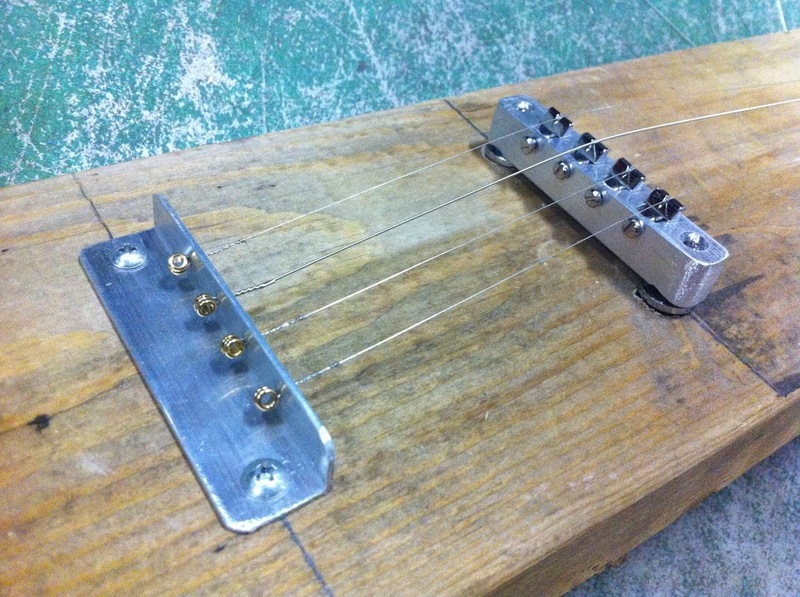 Make your own fanned fretboard with this tutorial. 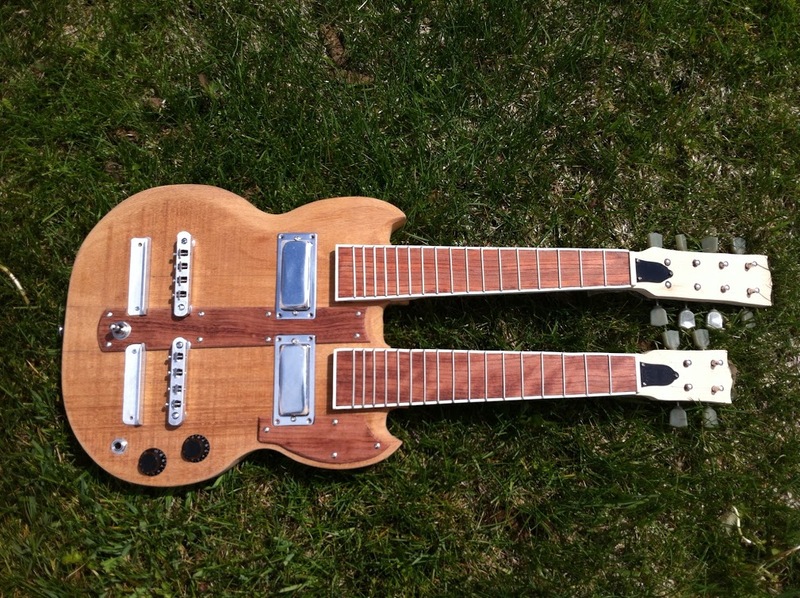 I’ve been planning on building a double neck mando/uke for a couple of years. 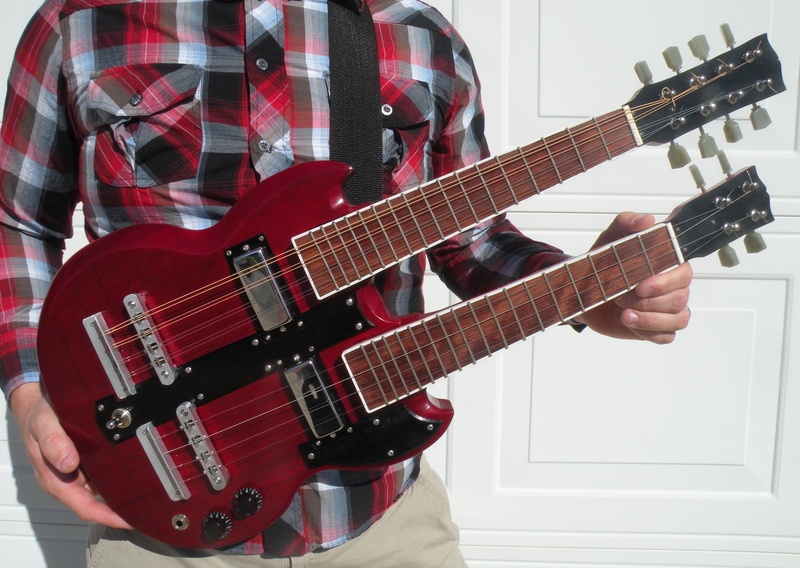 I like the aesthetic of the Gibson Double Neck EDS-1275, especially the top neck having double the strings of the bottom one. Different things delayed me starting this project, and I’m glad they did because I was able to refine my techniques and gain the proper tools to do the job right. This was my most involved and labor intensive project yet. 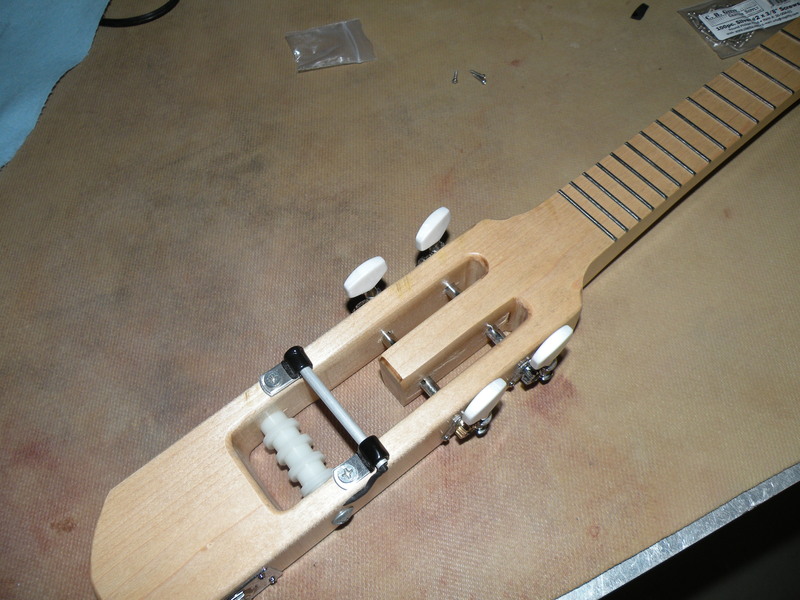 I wanted to have Tune-o-matic style bridges for this instrument, but I couldn’t find any ones with four strings. 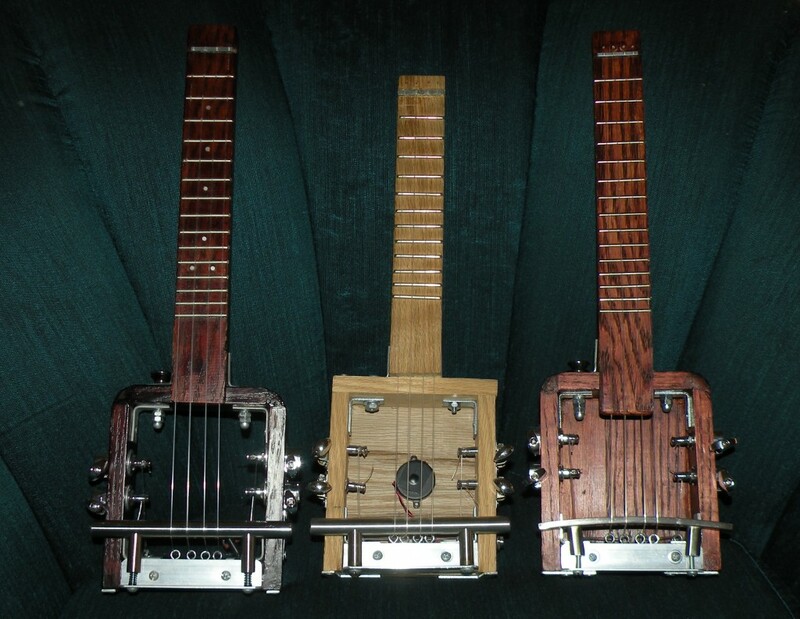 After seeing a thread on the Mandolin Cafe Forums, I contacted Pete Mallinson of Almuse Mandolins to ask him some questions about some custom bridges he had made. He gave me the confidence to mill my own with a drill press and some needle files. The above picture was a test run that I did. 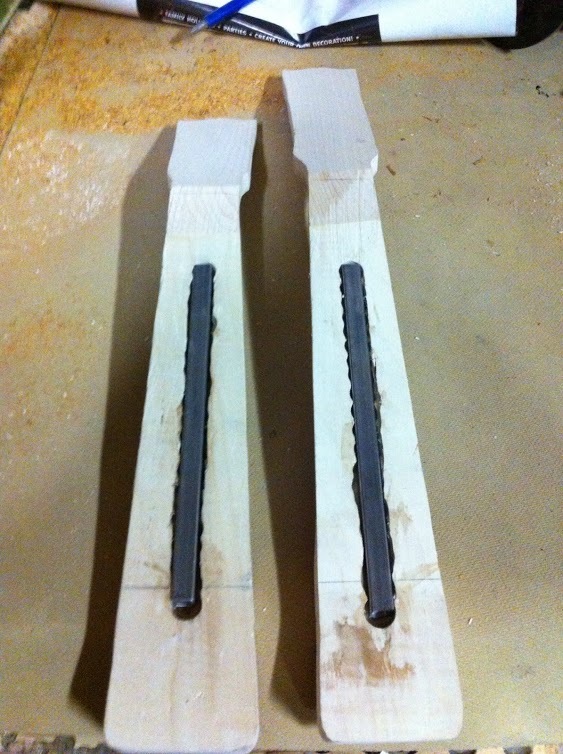 I refined the process for the two bridges I used for the Mandolin/Ukulele. 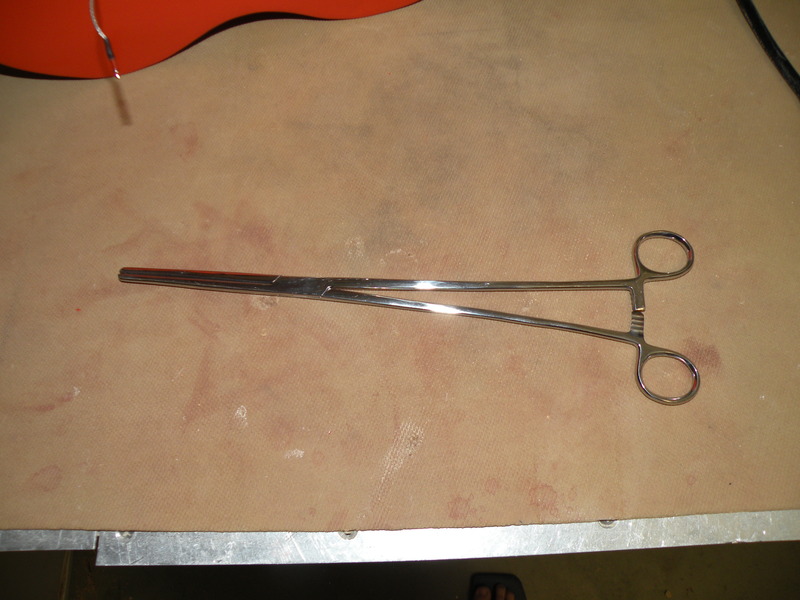 I purchased some blank saddles for the 8 string mandolin side and cut string slots with some speciality files. I did my normal layout and size check before I started to cut things. Both of the necks have 17 inch scale lengths. 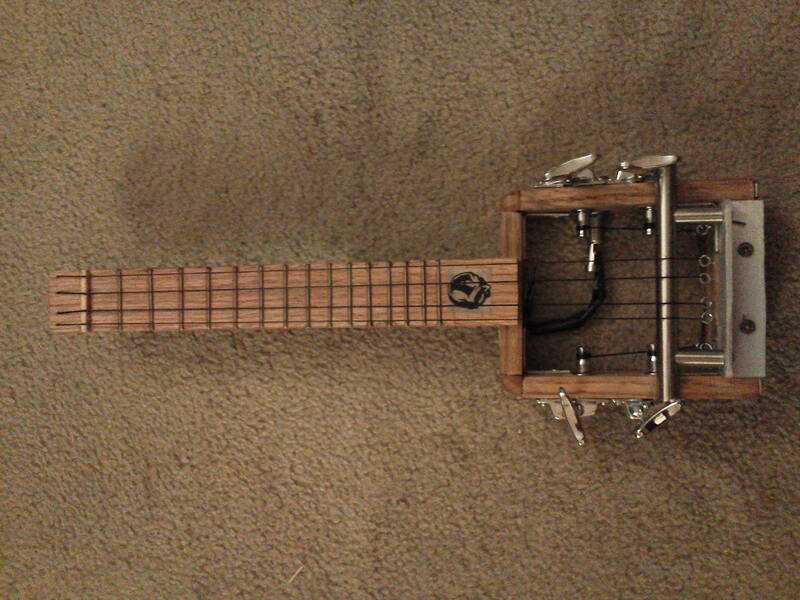 I tuned the mandolin neck an octave lower than a regular mando, so it can be considered an “octave mandolin”. I cut the body out of solid mahogany and beveled some of the edges. 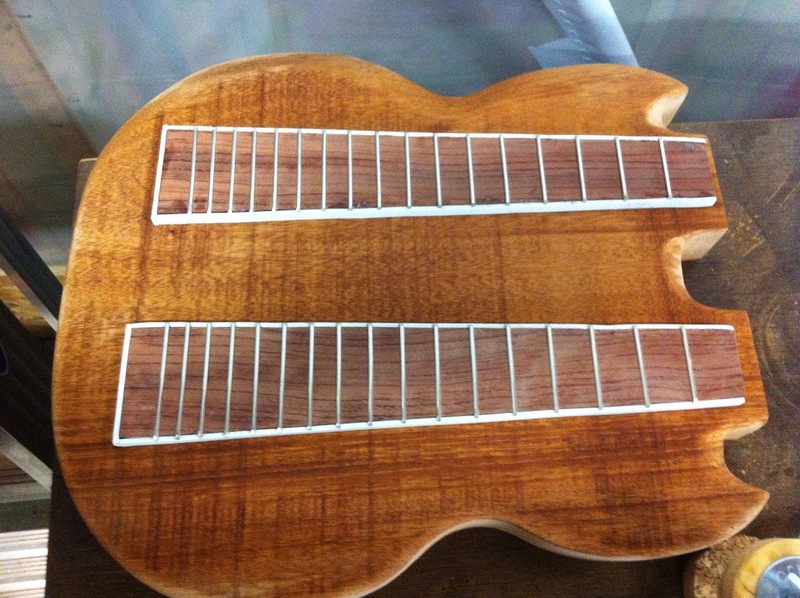 The fretboards are made of bubinga and were bound with plastic binding. Even though the mandolin has more strings, the fretboard is narrower to keep the feel of a mandolin. 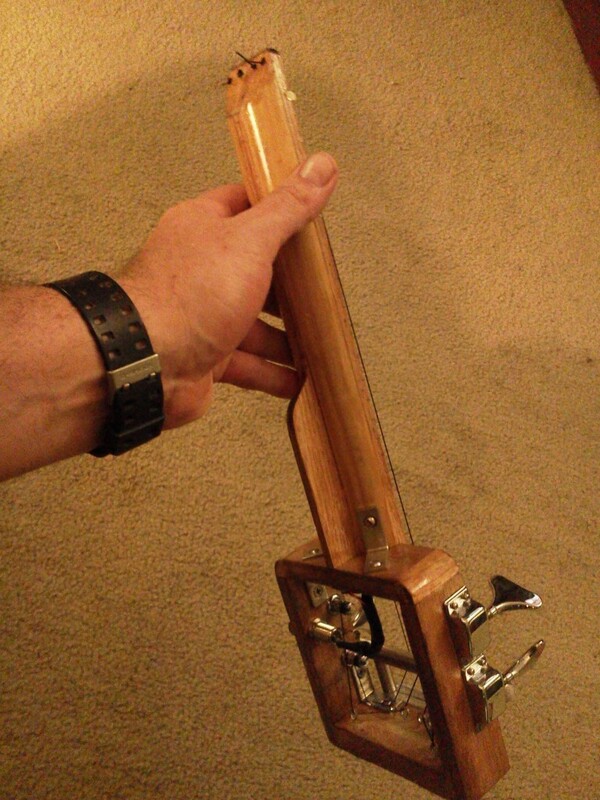 i’ve made a bunch of electric ukuleles, but I have never put a truss rod in them. With a short scale and quality wood, I didn’t see the need. 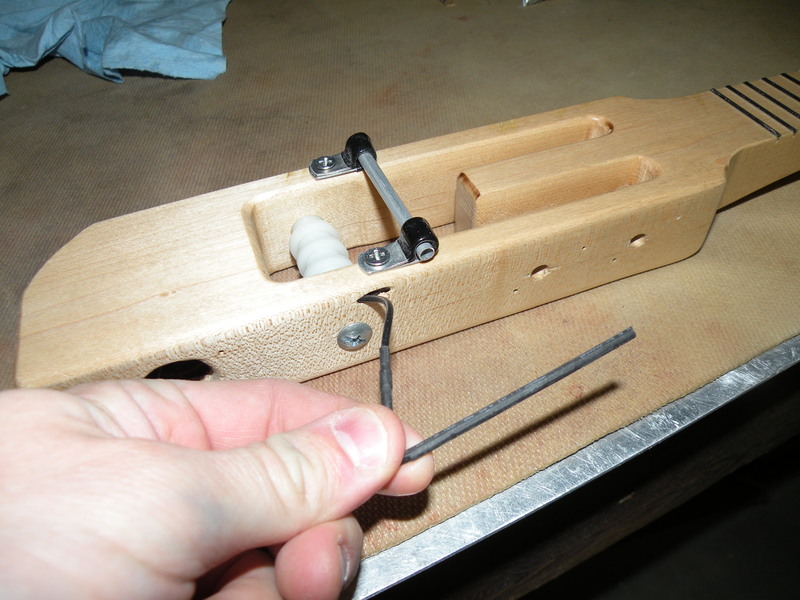 I did put a non-adjustable truss rod in the mandolin neck to combat the added tension of the 8 strings. I put a matching one in the ukulele neck for balance. I routed out the pockets and epoxied the rods. 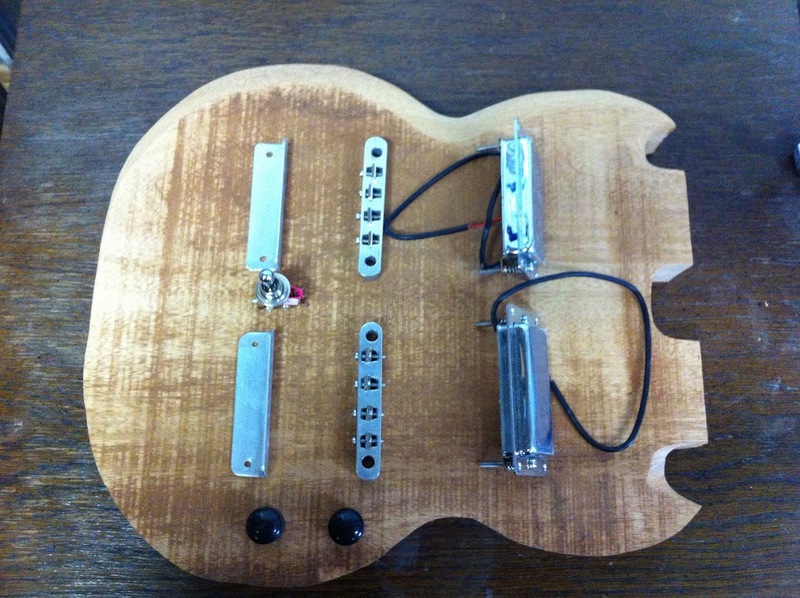 After the body was routed, a made some wooden pickguards and dry fitted everything. 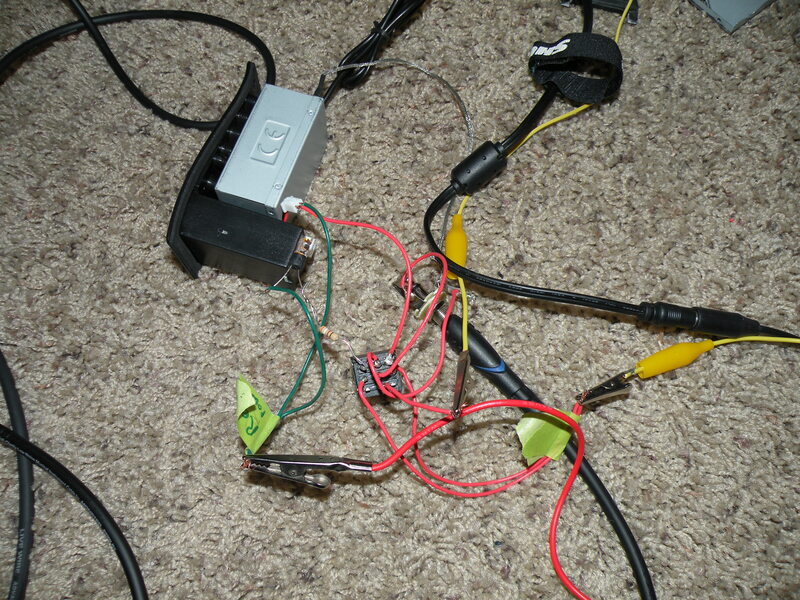 I then carefully disassembled everything and put the hardware aside. 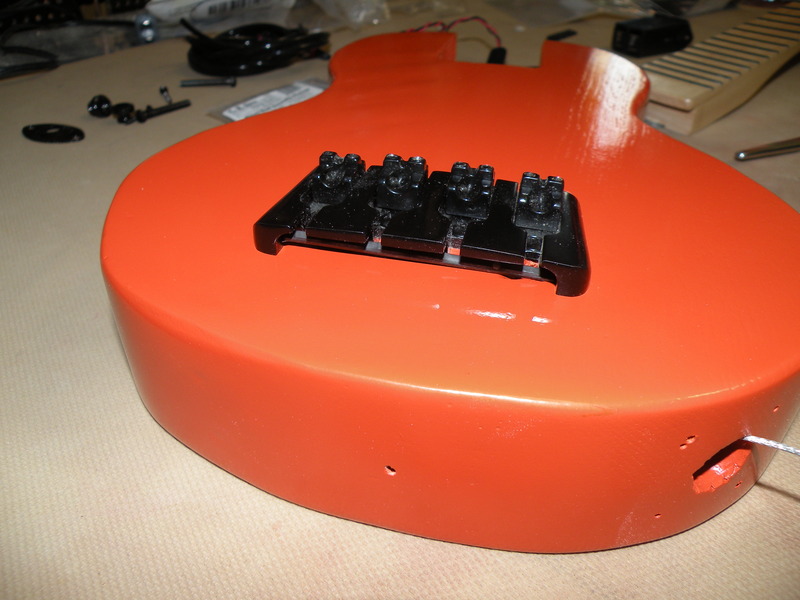 The body and necks were tinted with a transparent red nitrocellulose stain and then clear coated with glossy nitrocellulose. 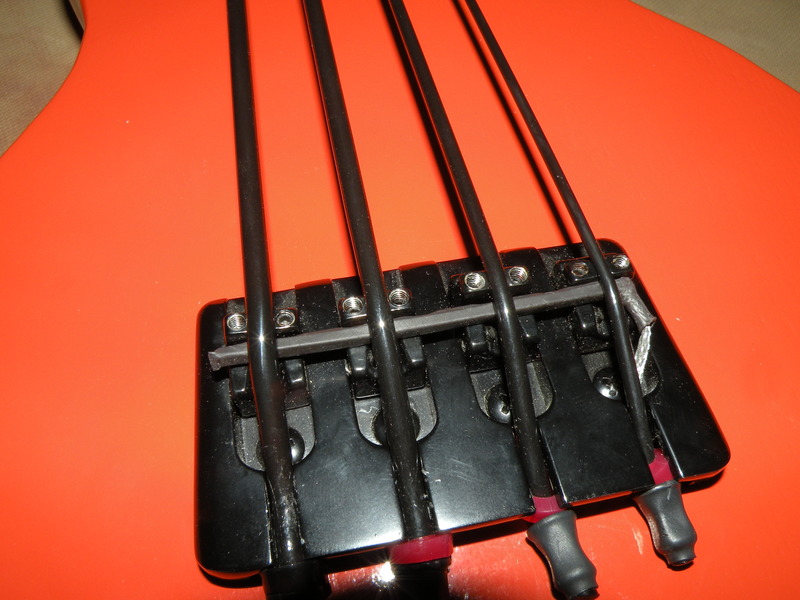 The headstock faces were sprayed with opaque black. 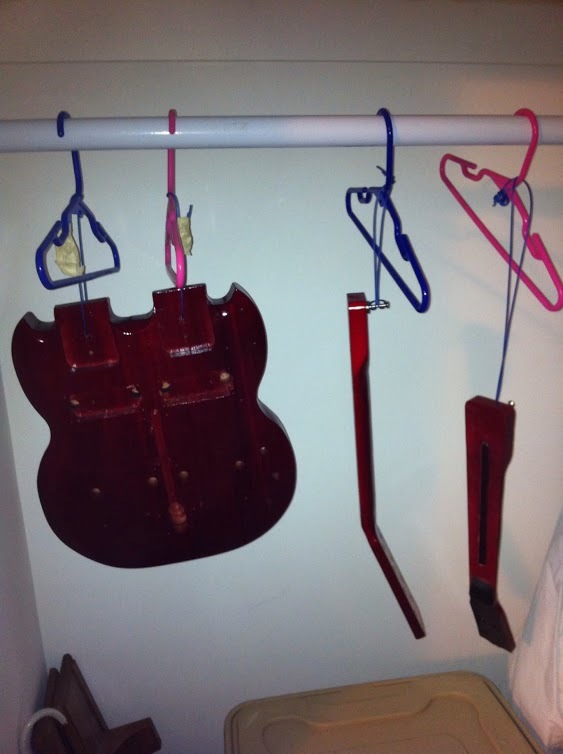 “After the paintin’ comes the waitin’.” I stowed the body and necks in a closet for a 2 weeks to let the lacquer cure. This thing is a real beauty. I really like the look and texture of the black, wooden pickguards. 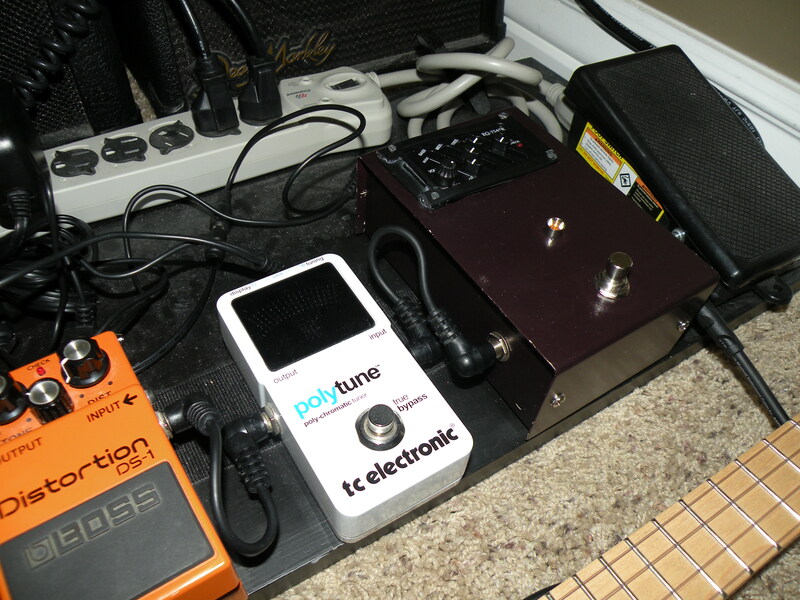 The pickups look like humbuckers, but are really single coil. 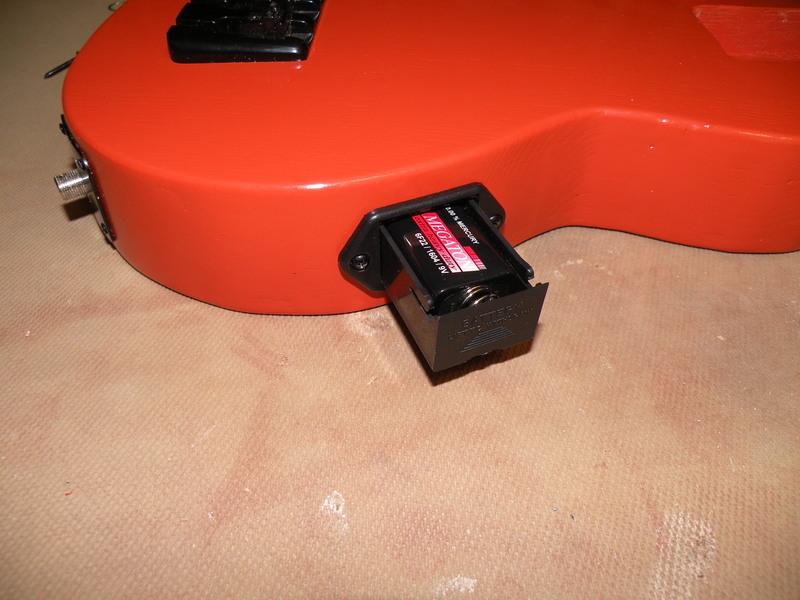 The three-way switch by the tailpieces is able to select either or both necks. Under the cavity cover, a couple of 500K potentiometers and a .022uF Orange Drop capacitor to provide a master volume and tone control. 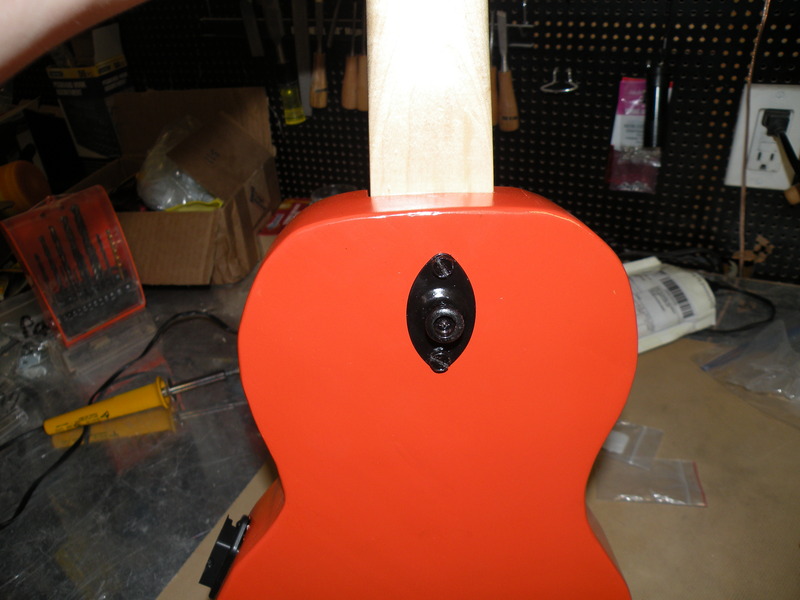 I used 4 neck mounting ferrules to attach the necks. 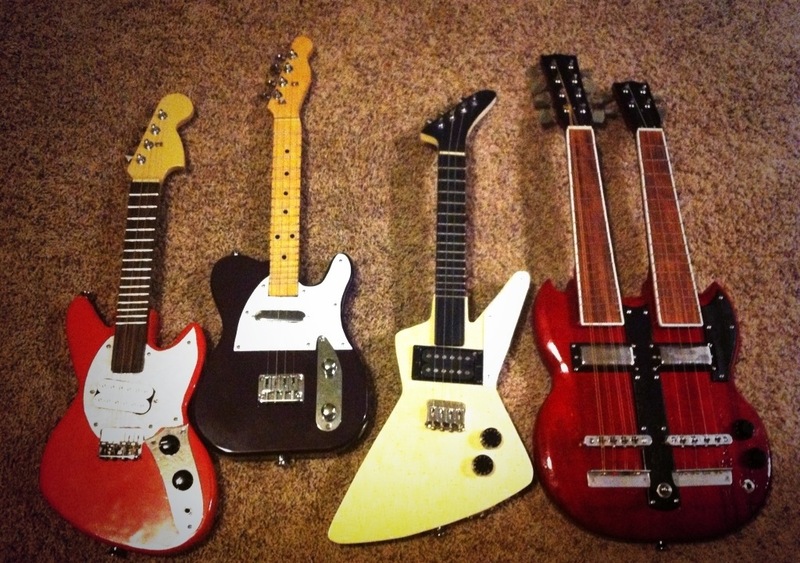 They might become my new standard for mounting necks. They look and work very nice. 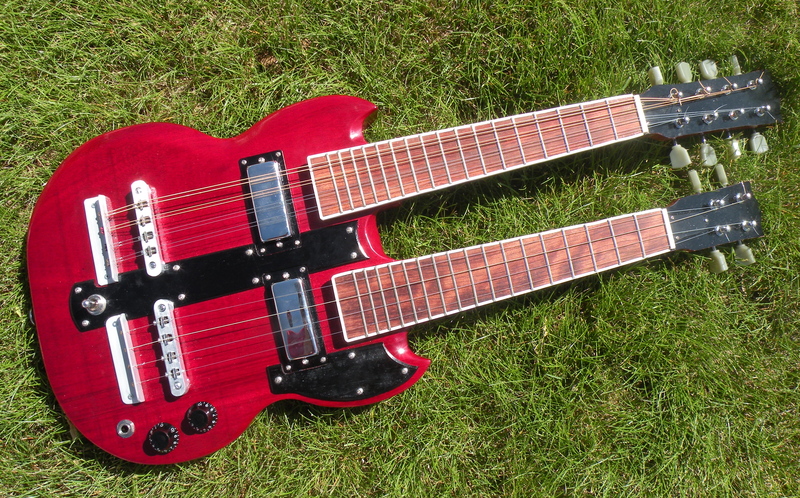 Talking about the double neck. I’ve made instruments out of all sorts of stuff. When I saw an old skateboard deck at a garage sale, I had to have it. 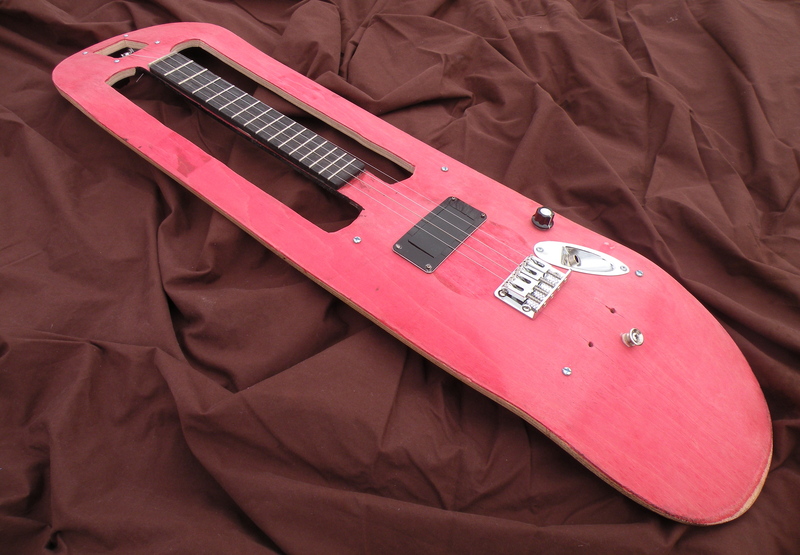 I thought it would make the perfect body for an electric ukulele. 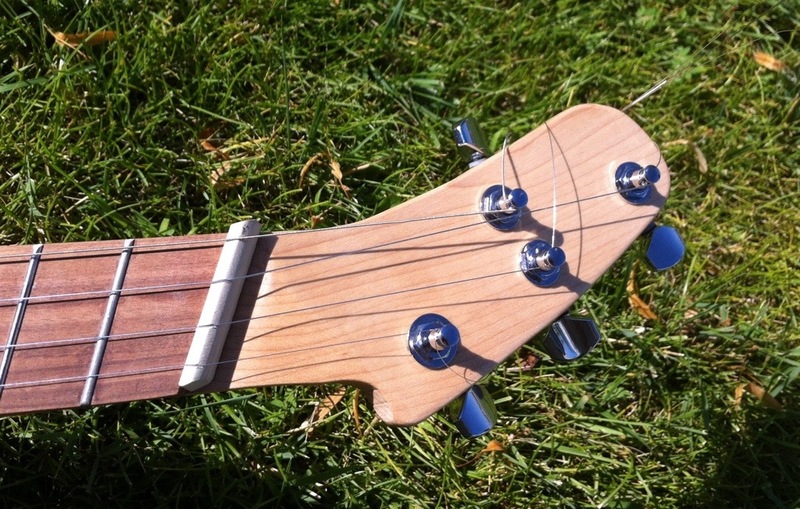 Because both ends curve back, I didn’t have to do anything to angle the headstock. 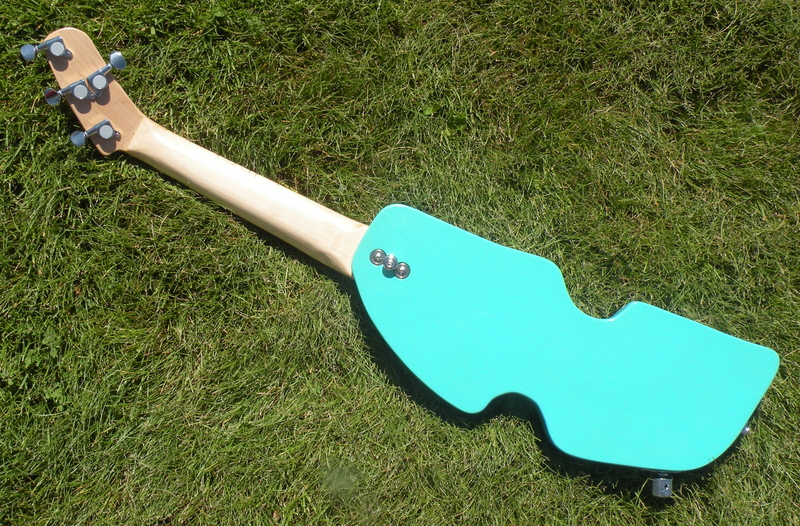 Using a scroll saw, I cut out the space for the neck, headstock, pickup, and Stratocaster-style jack plate. I kept the wood above and below the neck to give the instrument more stability and to the keep overall shape of the skateboard. 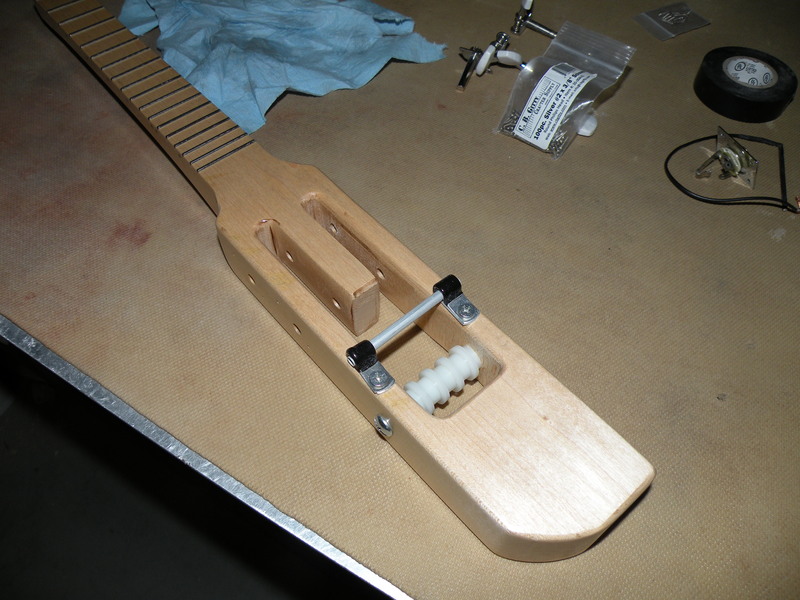 A fretboard with a 17 inch scale was epoxied to the neck. Most of the grip tape was left on the board. I stripped the grip tape from the bak of the neck. I was going to add about 1/4 inch of wood to the back of the neck, but that would have made it too thick. Instead, I just carved the neck a little bit and stained it black. 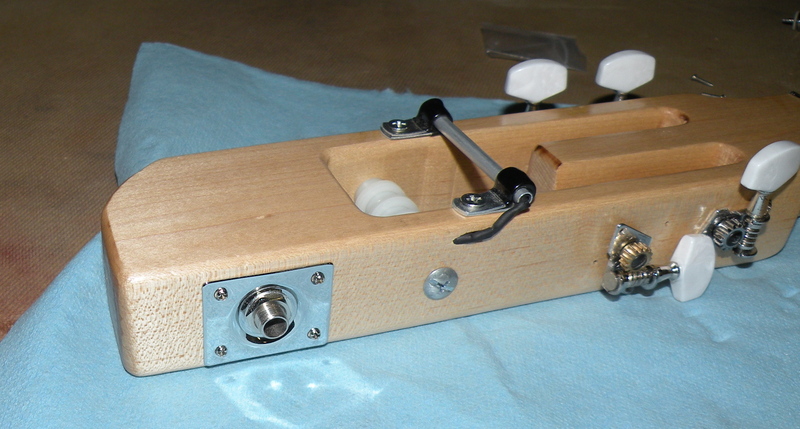 A board with rounded over edges was attached to the back to cover the wiring and components. 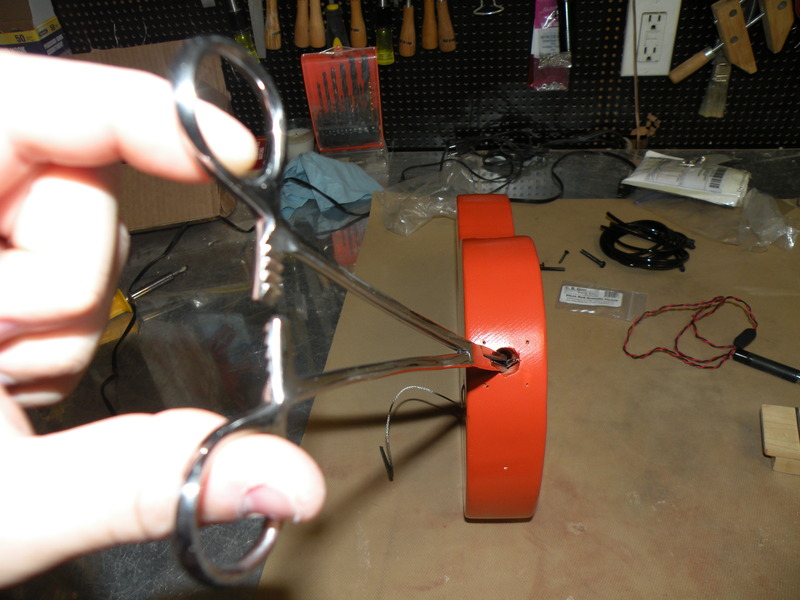 I made a pickup ring for the single coil pickup with some black pickguard material. 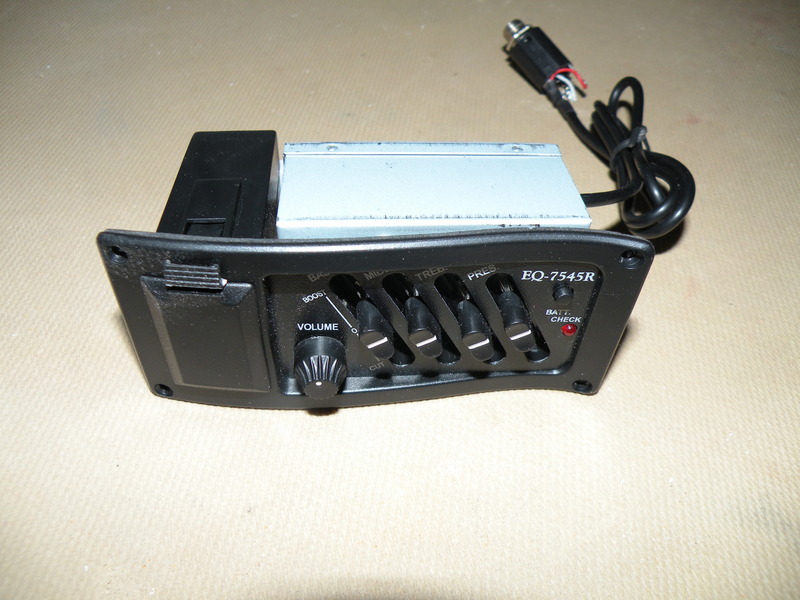 The pickup is connected to a volume potentiometer. 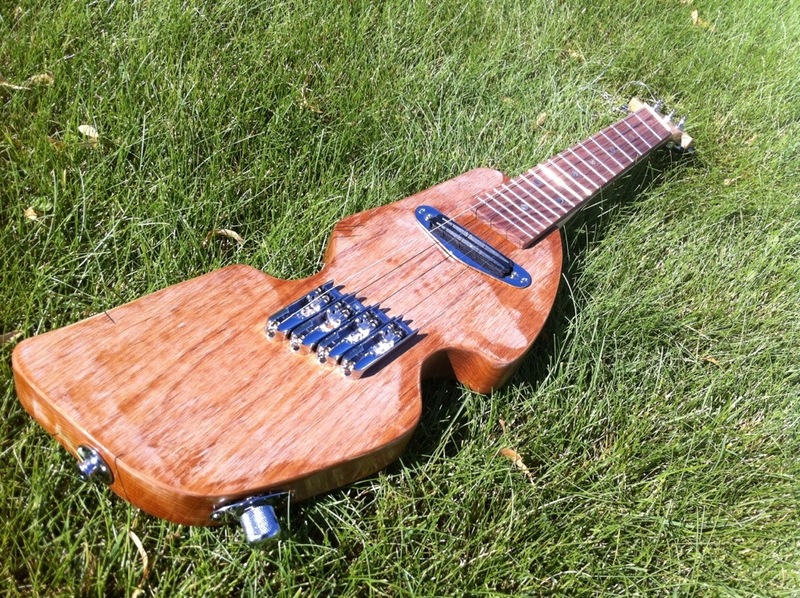 Out of all the electric ukuleles that I’ve made, this was the fastest to make. 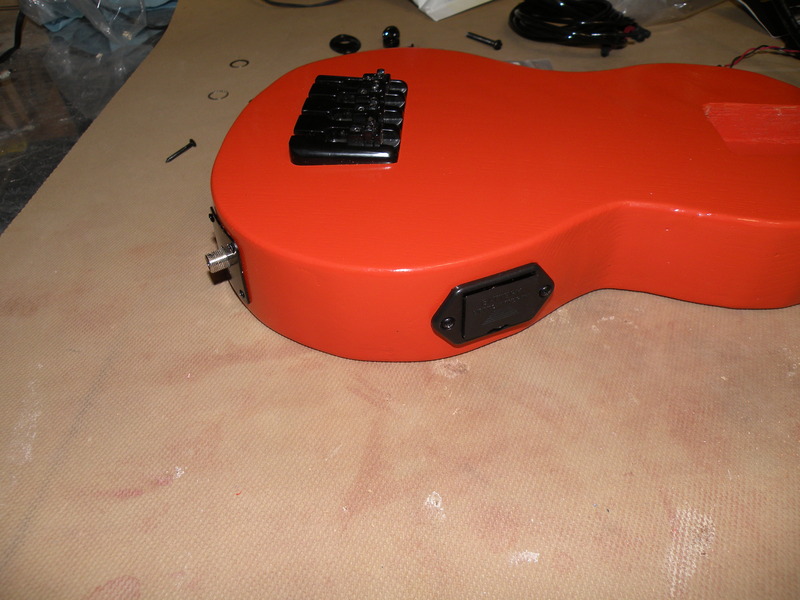 Not having to rout out the body, carve and shape the neck, and apply a glossy finish really cut down on the build time. 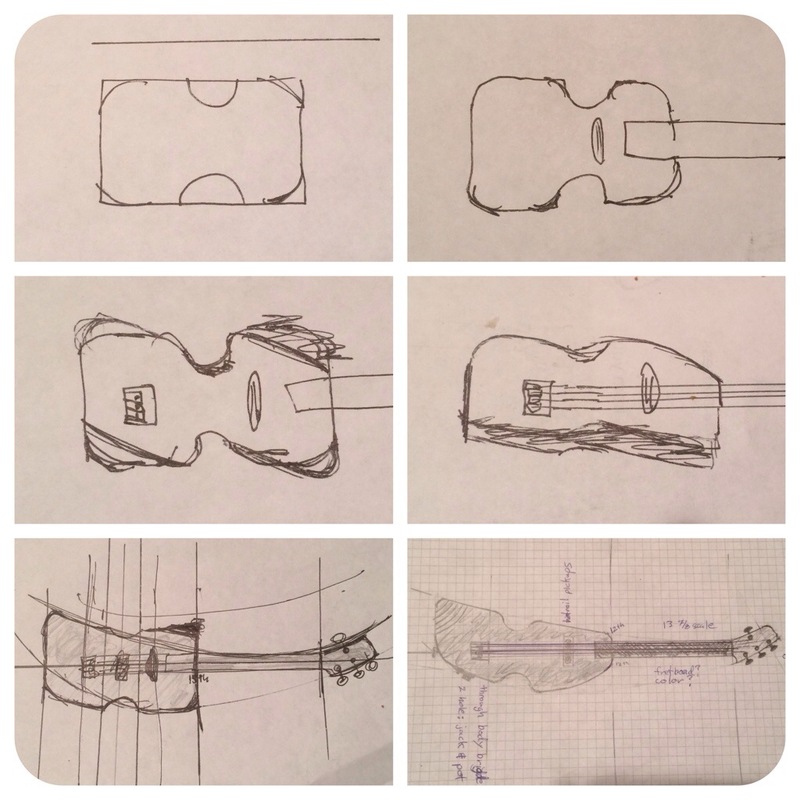 Whenever I do a ukulele project that has a logical, sequential order I try to document the process and make plans. These are made available for people to use, modify and enhance. Right now I have two available for immediate download, with more coming this year. Have fun building and remember to take pictures, make a video or find other ways to share your finished project. We love to see what you’ve made! Click below to see the plans available to download. I wanted to make a ukulele with the longest possible scale that would still fit in my travel case. Before staining the body, I made sure that everything fit properly. 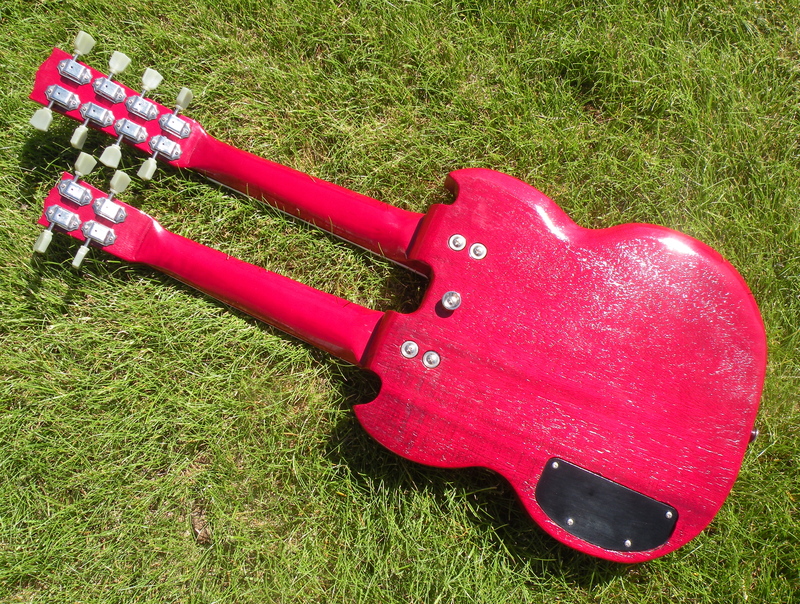 The “Les Paul” style body was made with a single piece of cherry wood. The scale length is 19 inches, and its overall length is 21.5 inches. Even though the scale length is 19 inches, I tune it like a reentrant tenor/concert/soprano. I prefer that tuning and it works better with most of the ukulele sheet music that I have. The fretboard and bridge are made of rosewood. The volume knob is made of ebony. 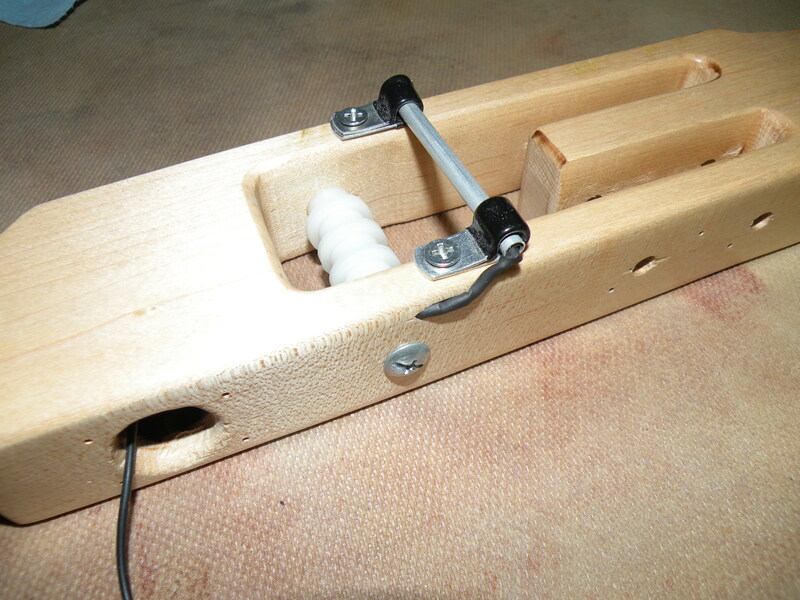 A piece of plastic pipe directs the strings back towards the tuners. 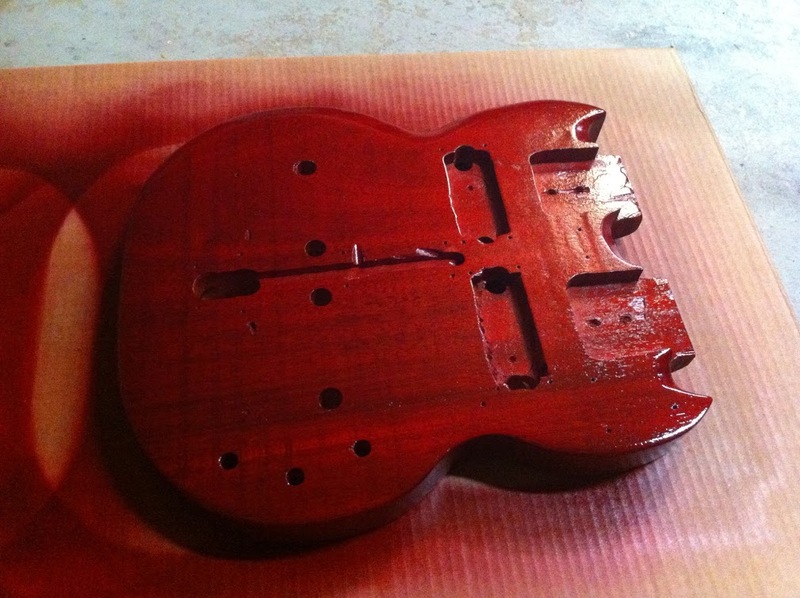 I used transparent red nitrocellulose lacquer followed by nitrocellulose clear coat to give it a finish similar to Gibson’s “Heritage Cherry” finish. 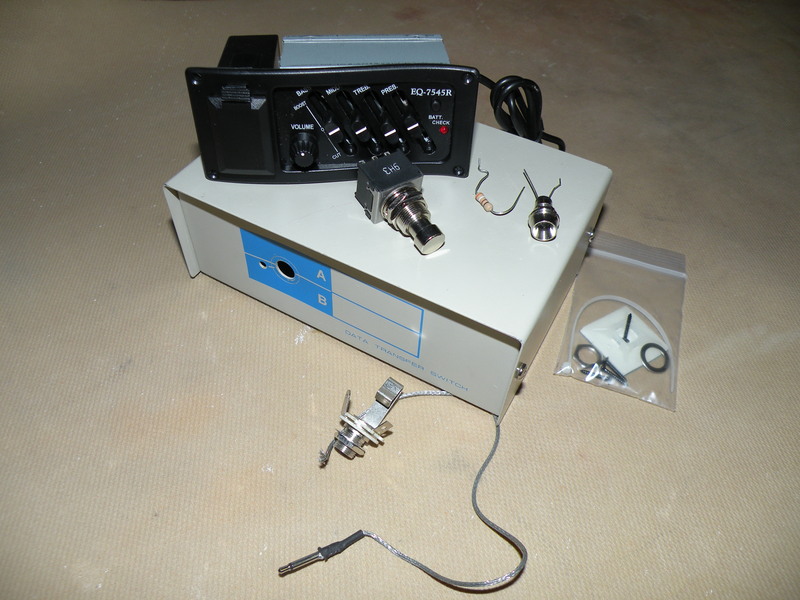 The under saddle piezo pickup is soldered to a 500K ohm potentiometer to control the volume. 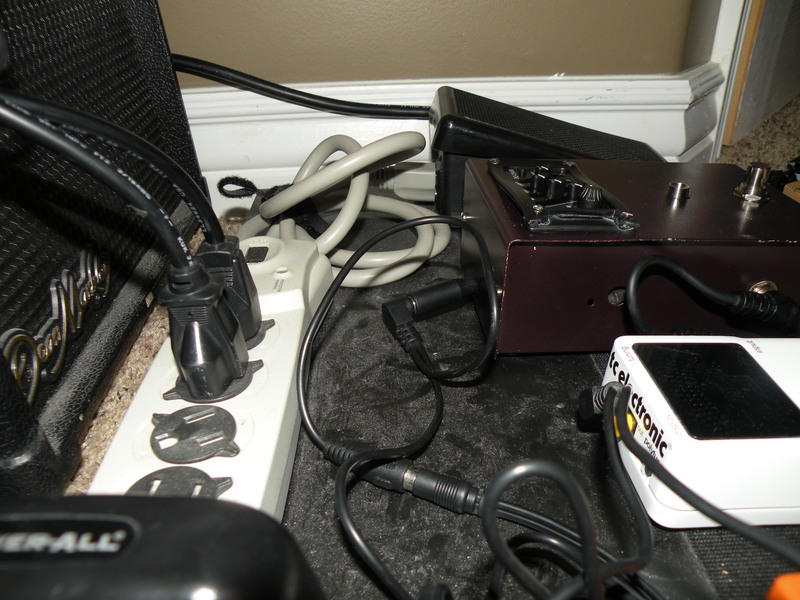 The output jack is attached to an upside down stratocaster style jack plate. 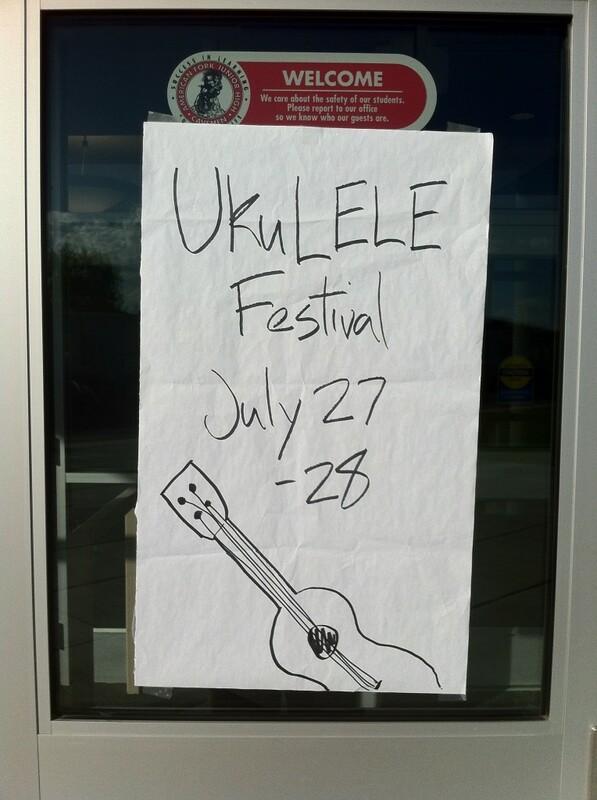 I attended Utah’s Uke Fest on July 27-28, 2012. This festival had classes and workshops during the day with amazing concerts at night. I learned new things and was inspired to take my playing to the next level. 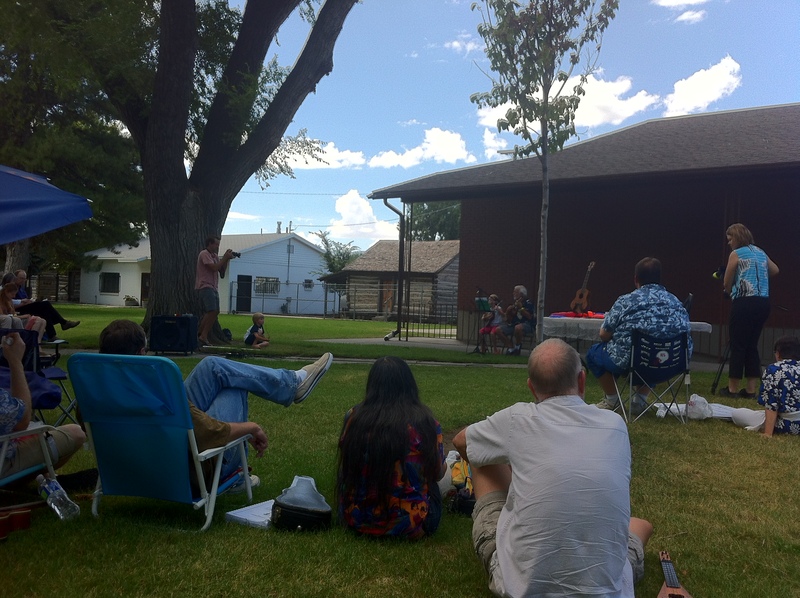 My favorite part of the festival was getting to meet other ukulele enthusiasts from the surrounding area. 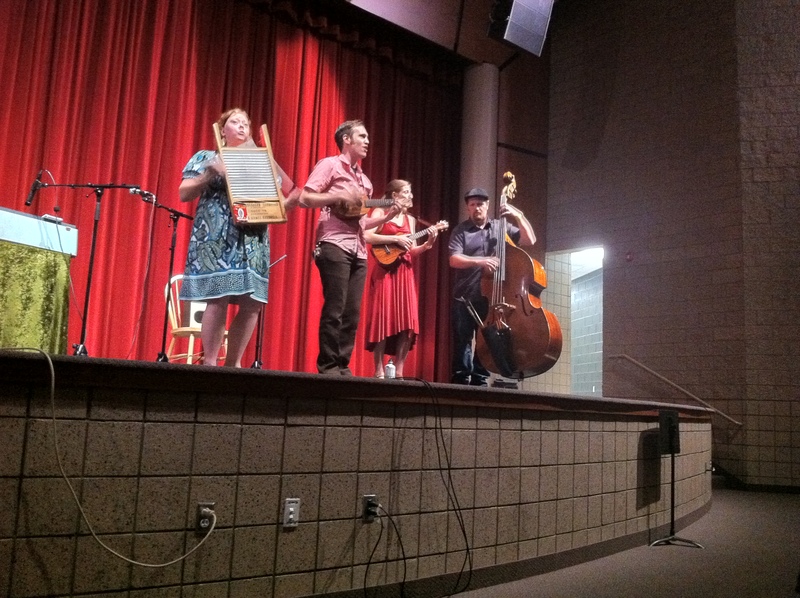 Sarah Maisel and Paul Tillery and “The Quiet American” performed on Friday night. The groups did separate sets, but they performed a song together at the end. 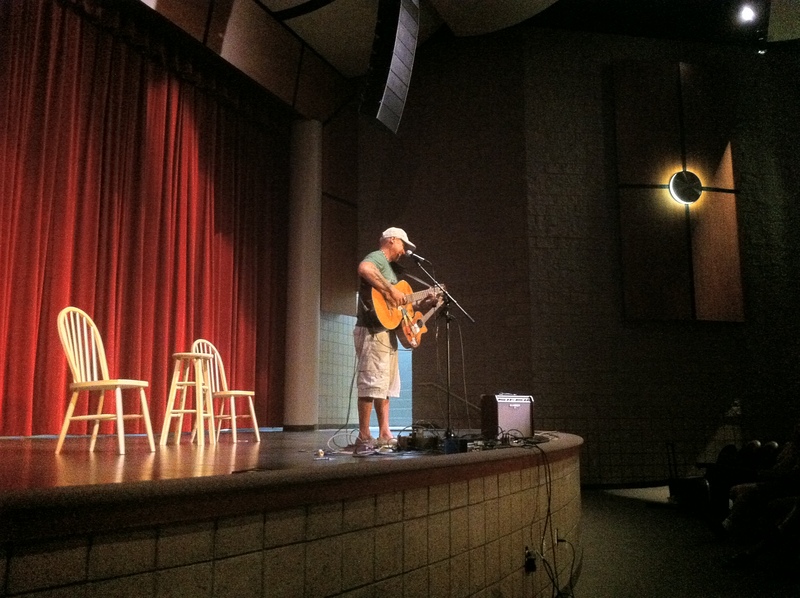 On Saturday at noon, there was an open mic contest. The performances were great, with lots of brave people displaying their talents. I was lucky enough to take 2nd place at the open mic contest! 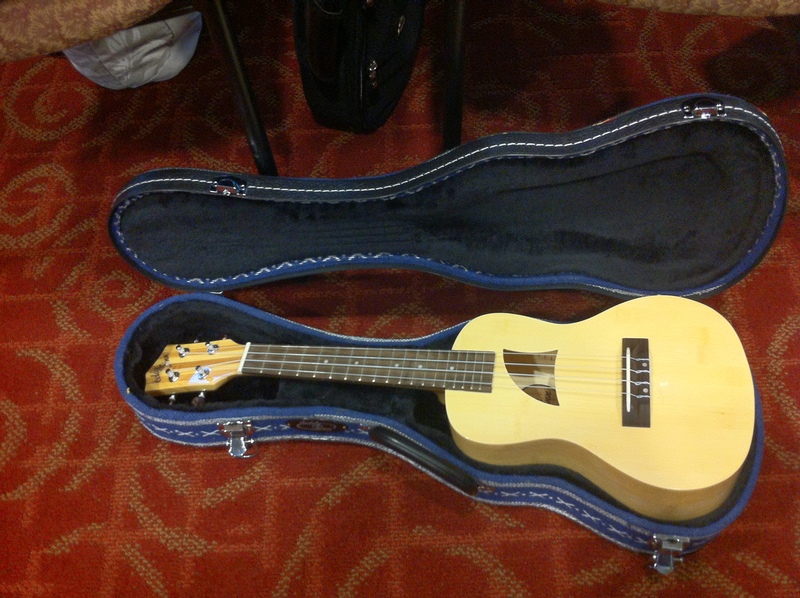 My prize was a beautiful Eddy Finn Bamboo ukulele and a hard case for it. 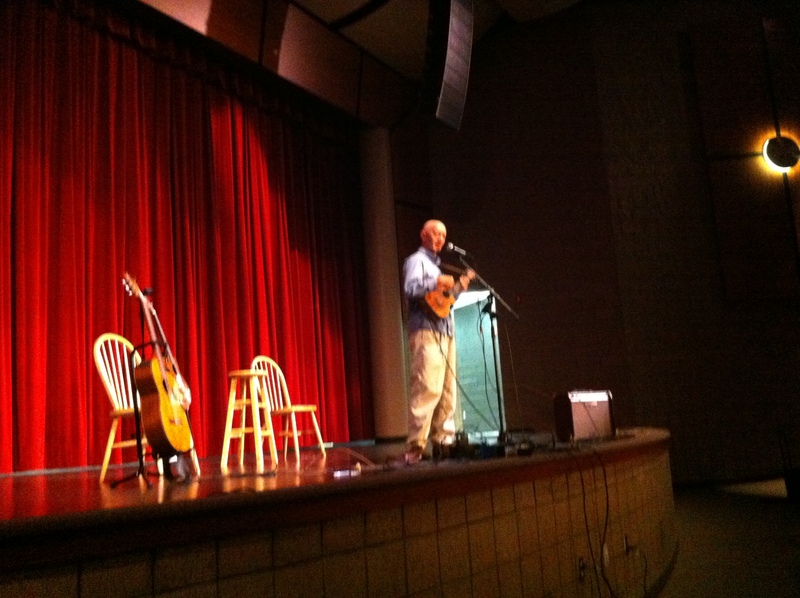 Paul “Tommy” O’Connor played a few Celtic tunes on the ukulele at the Saturday evening concert. Bolo Rodrigues also played on Saturday evening. He attaches a ukulele to the bottom of his guitar and switches back and forth between the two instruments. 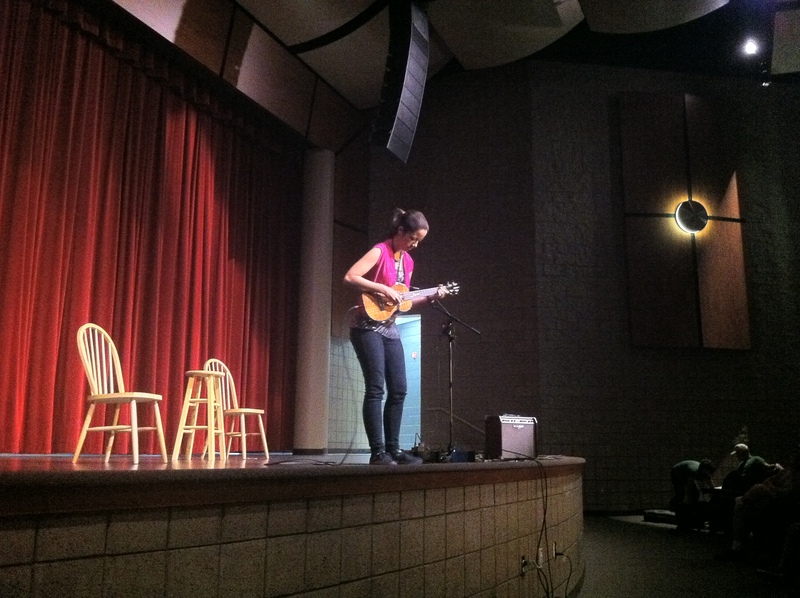 Brittni Paiva was the headliner of the festival. Her spectacular performance was a great capstone to a very fun couple of days.